Thank you all so much for playing along with me this week for the Get Inky challenge. All the projects this week we simply awesome and it was difficult to chose just three to highlight. But, I did see three that stood out for me. This card by Billie A has the most interesting face stamp, in addition to the beautiful inky background. 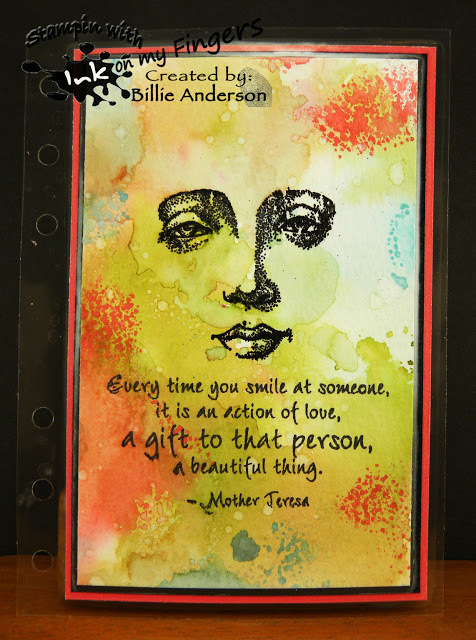 I love this ink blended background panel by Tanja at Little Art Cottage. I also love that she used a pearlized water to spritz her background with texture. Nice touch. 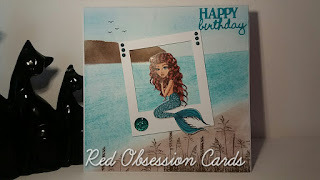 Last, this scene by Red Obsession Cards is simply lovely. The ink blended back is lovely and the coloring on the mermaid is just awesome. Once again, thanks to all who played along this week and congratulations to the featured 3 projects. Don't forget to grab your featured button in the right sidebar. Be sure to stop back by tomorrow to participate in the new challenge! Thank you for picking my project as a favorite. I love doing the watercolor backgrounds. Congrats to the other favorites.